A local credit union operates dozens of branch locations, drive-up ATM’s and 2 main locations. With a large profile of annual energy usage, the company needed a comprehensive strategy to satisfy the unique energy needs of a multi-location financial institution. In addition, they had a desire to reduce energy costs, become more sustainable and was dedicated to reducing their corporate carbon footprint. In an effort to gain control of energy costs and provide long-term price certainty, the credit union partnered with Power Management Company (PMC), a local energy consulting firm, to develop a strategy to optimize energy purchasing across the organization. The process included analyzing facility consumption data, existing contracts, and considered wholesale markets and economic factors. With budget goals and business plan in mind, PMC facilitated an approach to assist the company in managing costs and minimizing risk while obtaining competitively priced and reliable electricity and natural gas. In addition, lighting upgrades and solar energy solutions for various locations were recommended to further address the desire for efficiency and sustainability. In total, all 45 locations were converted to LED lighting. The headquarters alone, their largest facility, was upgraded with over 2,400 interior and exterior LED light fixtures. The existing interior technology, T8 and T5 fluorescent lamps, were replaced with LED tubes and the existing ballast replaced with new LED drivers. All exterior lights were also replaced with new LED fixtures. PMC worked closely with management to design the most economical solar PV solution, identifying optimal project size and scope. 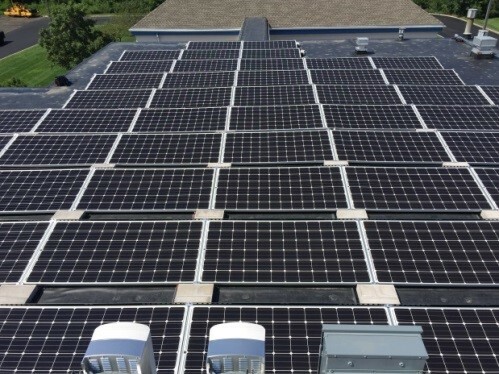 After evaluating various options, a 20.01kW ballast roof mounted solar array on one of the branch locations was determined to be an excellent option. PMC developed a turn-key solar PV system and managed all aspects of the project including design, material procurement, permitting & construction and system commissioning. The array consists of (58) 345W US made solar modules and two string inverters with optimizers, which maximizes the system’s production and efficiency. The credit union received a NYSERDA Rebate which paid for 15% of the project cost. The system is also equipped with real-time system monitoring to assist with managing the energy data from the solar array and to establish baselines and benchmarks for future production. The application offers minute by minute data tracking to indicate exactly what panels are in use, how effectively they are producing energy, how much energy is saved and more. The corporate decision to pursue an all-encompassing comprehensive energy plan has both environmental and financial benefits. 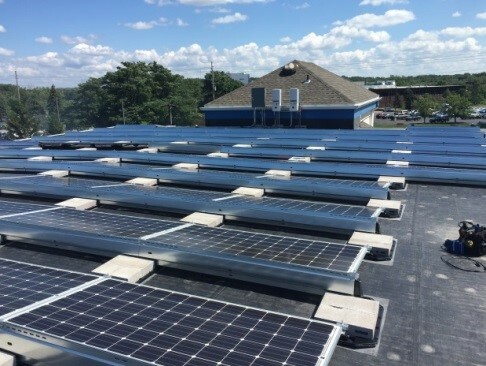 With the implementation of a long-term electric and natural gas hedging strategy, lighting upgrades, and solar project implementation, they have decreased their annual energy supply costs over 45%. Over the past 3 years this has equaled a monetary savings of more than $250,000. Not only are they able to enjoy long-term energy savings but have taken a big step towards achieving their corporate sustainability goals and fostering a culture of energy efficiency and conservation. In total, the credit union is projected to reduce their electricity consumption by almost 2 million kWh.